7 Quick Takes-Happy Birthday to Me! 1, Today is my 33rd go-round on this planet, and I have to say, I don't feel any different. Not any older. Certainly not more mature. My birthday experience was already enhanced by a 6:40am text from my father, not only wishing me a happy birthday, but informing me that there was snow up at the cabin in Wisconsin. Sigh. 2. I received a package from my parents yesterday with these delightful, beautifully decorated sugar cookies from a bakery in Milwaukee. So much deliciousness all in one box. 3. My super awesome husband bought me the iPad Air 2, and I am beyond thrilled. Unfortunately the iPad had to make some kind of detour to Korea, so tragically I will not be receiving it on my birthday. 4. Tonight is a first for all of us; our very first time trick-or-treating on a military base. Being the lazy thrifty woman that I am, I will be purchasing bags of candy from Target this afternoon, in hopes of massive discounts. You have to figure, if you wait until the day of Halloween to buy candy, they're already trying to make way for Christmas decorations, right? 5. In addition to the tasty Halloween cookies, my parents also combined their miles and got me a round-trip ticket to Milwaukee this upcoming week. For two days. Since my back pain has gone from bad to worse, I'm seeing a neurospinal surgeon in Milwaukee for a consult/second opinion. My doctor here in Georgia suggested spinal fusion surgery, and I wanted to make the rounds (so to speak) before scheduling anything that drastic. So if you have any prayers to spare, I would greatly appreciate them. 6. In costume news, Tony is going to be a "inja turtle" (Michelangelo), and Alessandra is going to be a spider. Wrestling a fussy, already-sugared-up toddler into a costume with multiple legs attached to the body? Yeah, that's going to go well. 7. I received a birthday card from Will and the kids this morning, and it was one of the best presents ever. Seriously, nothing makes me happier than hand-written cards from my loved ones. When Will asked Tony what he wanted to write in my birthday card, Tony's response was, "Should I have some birthday cake?" Alessandra's response was to slap the card out of Will's hand, and to dump her lunch all over herself. Happy Halloween! 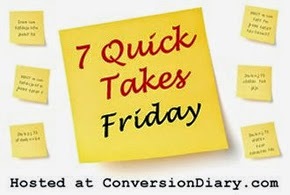 For more Quick Takes, visit Jen at Conversion Diary!